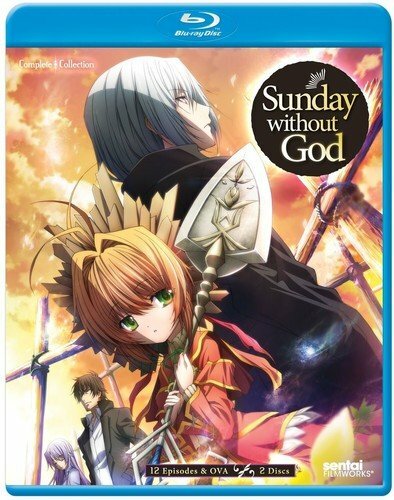 Plot: On Sunday, God Abandoned the World…Fifteen years ago, God abandoned the world and closed the gate to Heaven, leaving the souls of humankind trapped in limbo. With the dead unable to rest and the living unable to have children, the world is slowly coming to a halt. The only key to mankind’s salvation rests with the Gravekeepers, mysterious beings charged with the task of sending the deceased to their final resting place. Twelve-year-old Ai, one of the last children in the world, soon finds herself shouldered with the burden of becoming her village’s newest Gravekeeper. But beneath the village’s unassuming exterior lies a dark secret that is revealed with the arrival of a gun-wielding stranger in black. With her position as a Gravekeeper now uncertain, Ai has no choice but to set out to put the living dead to rest. But in a world where no one can die, is death truly the ultimate blessing? A journey unlike any other begins as Ai unlocks the secrets to life and death on SUNDAY WITHOUT GOD!